Ventnor Beach, is a few minutes away, as the crow flies, but with a zigzag route downhill, allow for a fifteen minute walk. If you prefer to drive, (avoiding the uphill walk home after a hard day on the beach), there are car parks either end of the Esplanade. Parking at the cottage is free and on-street, a few hundred yards along Ocean View Road.The town centre with its shops, pubs, cafes and restaurants is halfway between the cottage and the beach. The cottage accommodates six people comfortably with it's three bedrooms, large family bathroom and downstairs WC with basin. Upstairs are two double bedrooms, (one with a TV), and a bathroom which has bath, separate shower, washing machine, tumble dryer and boiler which provides instantaneous hot water and keeps the cottage lovely and toasty during the winter months. Downstairs the kitchen has a dining table which seats six. This leads to the living room where there is a TV with DVD player, books, games and DVDs. The third (bunk) bedroom is also on the ground floor. Outdoors there is a small but perfectly formed gravelled terrace with table and seating for maximum enjoyment of the view. It's enclosed with a picket fence making it safe for young children and pets. There is also a BBQ. The Style of the interior is 'shabby chic' with white wooden floors, cream leather sofas and a cosie vintage vibe. At Ocean View you'll (hopefully) find everything you'd expect at home from cafetiere to dishwasher, all scrupulously clean and well maintained. There is also free Wifi and for the younger guest a travel cot, high chair and stair gate are available. Dogs are welcome by prior arrangement (a £10 charge is made so that the cottage can be steam cleaned as a courtesy to the next guests). I live just a few minutes away from Ocean View at Pine Point, my Bed & Breakfast. Unlike agents or absent landlords I am always available should there be any problems at all or if you need any local hints and tips during your stay. Ventnor is a very special place - the nicest place on the Isle of Wight in my (very biased) opinion - and Ocean View is a special cottage. As soon as you open the door the sea view captivates - it's a real 'Tardis' of a holiday hide out. Dare I say location, location, location? If you come to stay by the sea then that is precisely what you want to see out of your windows. Ocean Views delivers, with stunning views you'll find hard to forget. The large family bathroom upstairs has a bath, seperate shower enclosure and also contains the washing machine and tumble dryer. The cloakroom with WC and basin is on the ground floor next to the bunk bedroom. The living room has 2 leather sofas, TV with DVD, a small library of books and games. In the kitchen there is a dining table with can accommodate six people. The small terrace which has a table & seating & a fabulous sea view. A travel cot and high chair are available. A lovely, warm, clean house, with everything you need. We loved the views and the fabulous walks on the downs. The cottage was as described. Lots of light and lovely to wake up to a view of the sea. Plenty space downstairs and in the two double bedrooms and bathroom. Lovely places to walk the dog . We enjoyed ourselves. lovely house in good location with super view of the sea . We had a great family weekend away before our granddaughters go off to university . Lovely clean property, great views, however. The property was great, clean, fresh, great views, however my elderly parents did find the entry steps a little difficult, the stairs to the first floor were also very steep. Parking was difficult on occasion. On the whole a great short break, we would come back again now knowing what to expect. I felt really bad about the issue your Dad had with the stairs. Hope he enjoyed the fudge. We arrived at the cottage and found it even better than in the photos - super clean and bright with beautiful vintage inspired decor and a breathtaking view of the sea. We enjoyed a weeks stay and really didn't want to leave at the end as we felt so relaxed and at home. Debby, the owner, was very attentive in making our stay stress-free and she even posted our cocktail shaker back to us!!! Ventnor is such a lovely place, if a little hilly but it more than helped burn off the amazing crab pasties which we enjoyed at the Crab Shed in Steep Hill Cove (in front of Ventnor Botanical Gardens). Our Border Terrier, Nelson, absolutely loved the dog friendly section of Ventnor beach and all the beautiful walks along the Coastal Path. We would more than recommend Ocean View Cottage and hope that you have as good a time as we enjoyed. So glad that you guys (and Nelson!) made the most of everything that our lovely Ventnor has to offer and felt at home with Ocean View Cottage as your holiday home. Looking forward to seeing you again when you next need some R&R, IOW stylee! We wanted somewhere with sea views and this lovely cottage has them aplenty! It has been beautifully decorated and is easy to find just outside the town of Ventnor. Its very hilly here, but good to build those thigh muscles. Already planning a return trip! Ah, but the views make the uphill climb all worthwhile! Look forward to seeing you again at ocean View Cottage. Ventnor is situated at the southern most tip of the, (roughly diamond-shaped), Isle of Wight. Being built on terraces around the natural amphitheatre of Ventnor Bay, the town enjoys fabulous sea views out across the English Channel. Ventnors' hay day was in Victorian times. Attracted by the mild climate and fashion for ‘health giving’ sea bathing, the well to do built splendid villas and huge numbers of visitors arrived by train or by pleasure boats which stopped at the pier. The railway and pier may be long gone but the Victorian bathing machines, wheels removed and painted candy colours, are still in use as beach huts. Ventnor has a great selection of cafés, bars and restaurants offering everything from fine dining to fish & chips. Those wanting to cook at home can find excellent local produce available in Ventnors' independent shops which include artisan bakers, fish landed locally, a greengrocer, butcher/deli. You will find tea, coffee, milk etc at the cottage, ready for your arrival. 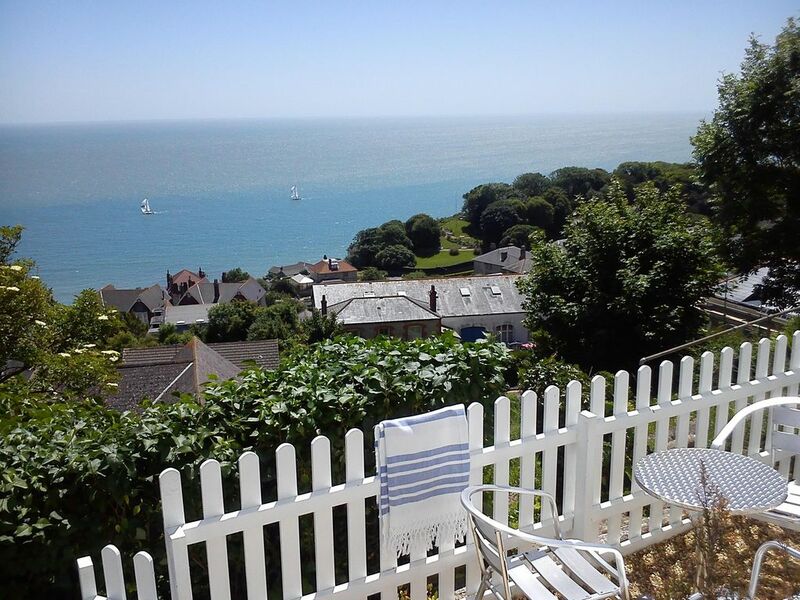 There are stunning coastal walks from Ventnor Beach – East along the sea wall towards Bonchurch and West, over the cliffs, towards Steephill Cove where you can eat crab and lobster just a few yards from the waters' edge. Northwards, up on the Downs behind the town, you can enjoy breathtaking panoramic views, taking in both the Solent and the English Channel from the highest vantage point on the island. The Isle of Wight enjoys more sunshine than anywhere else in Britain and Ventnor's own micro climate means that the Botanic Garden grows species not grown elsewhere in the country. Ventnor has two museums - The Heritage Museum and the Longshoreman’s Museum. Although tiny, they have fascinating photographic records of the area. Just a few miles along the coast is Blackgang Chine, a friendly little amusement park, great for young children. It’s an eccentric mix of rides, fairies and dinosaurs, all perched on ever diminishing cliff top gardens. Going inland from Ventnor you’ll find historic Appledurcombe House and the Isle of Wight Donkey Sanctuary. Car ferries run from Portsmouth, Southampton and Lymington on the mainland to Fishbourne, Cowes and Yarmouth on the island. The train from London Waterloo links directly to the Fastcat passenger ferry from Portsmouth to Ryde Pier where the train connects to Shanklin – a short bus or taxi ride from Ventnor. A Hovercraft also makes the Portsmouth to Ryde crossing. NB: An additional price of £10 per person is made to cover linen, towels, tea towels, etc. Any breakages/damages will be deducted from the security bond.